The U.S. Department of Transportation’s (DOT) Federal Railroad Administration (FRA) and the Texas Department of Transportation (TxDOT) have released 10 service and route options for new and improved conventional and high-speed passenger rail service connecting Oklahoma City, Fort Worth, Austin, San Antonio, and South Texas. The options are evaluated in a Draft Environmental Impact Statement (DEIS). During a 45-day public comment period, FRA and TxDOT will take comments on the 10 options and the seven recommended preferred options that the two agencies identified. Four public hearings will also be held to give residents a chance to learn about the Texas-Oklahoma Passenger Rail Study, understand how their communities may be affected, and provide comments. 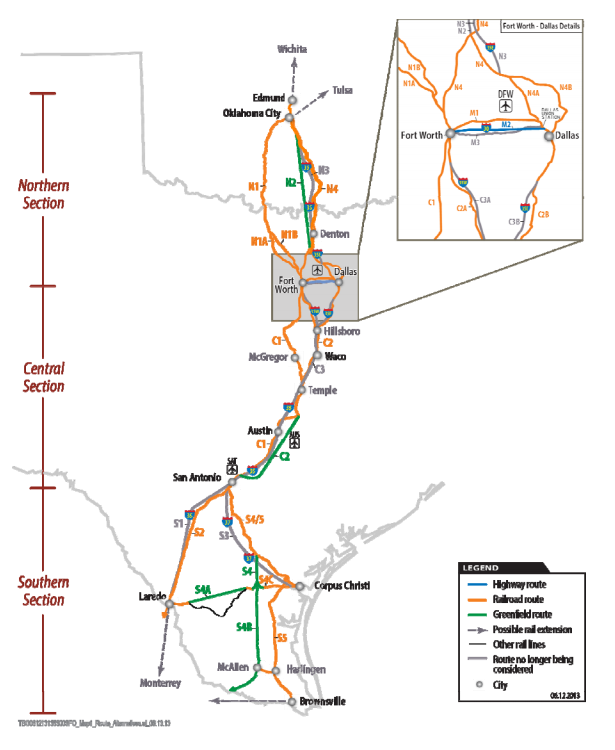 Current passenger rail service along the Interstate 35 (I-35) corridor includes three intercity Amtrak services from Oklahoma City to Fort Worth (Heartland Flyer), Fort Worth to San Antonio (Texas Eagle), and Los Angeles to New Orleans through San Antonio (Sunset Limited). More than 10 million people currently live along the 850-mile corridor, which is expected to grow by 39 percent in Texas and 25 percent in Oklahoma City by 2035. As a state with some of the largest metropolitan areas in the nation, spread out over hundreds of miles, Texas is now in high demand for alternative modes of transportation. Since the majority of the state’s population is centered in the eastern half of state, along I-35 stretching into Oklahoma City, the highways have experienced increased congestion. In fiscal year 2012, FRA awarded a $5.6 million grant to TxDOT to fund a study of new and improved passenger rail service to meet future intercity travel demand, improve rail facilities, reduce travel times, and improve connections with regional public transit services as an alternative to bus, plane, and private auto travel. The Texas-Oklahoma Passenger Rail Study evaluates routes and types of service for passenger rail service between Oklahoma City, Dallas, Austin, San Antonio, and South Texas. More information about the Texas-Oklahoma Passenger Rail Study can be found here. The Final EIS is projected to be released by early 2017. There are three public hearings scheduled to discuss these alignments, on August 9, 10, and 11, in Laredo, Austin, and Arlington, respectively. Relevant documentation is here if you have a few hours to spare and an enjoyment of poring over PDFs, while TxDOT’s page on the project is here. Just looking at the map, which I have embedded above, doesn’t give a clear picture of where the tracks would be. Streetsblog says it wouldn’t actually stop in “urban Austin”, but the map seems to indicate it would go near or by the airport, so perhaps this is a question of terminology. This project has been kicking around for awhile – Oklahoma got a federal stimulus grant in 2009 to study rail between Oklahoma City and Tulsa, which isn’t actually part of this proposal but may have been the genesis of what we now have – with TxDOT creating the Texas-Oklahoma Passenger Rail Study page in late 2013; as you can see at that link, there’s a separate project to link this rail line, if it happens, to the Houston-Dallas high speed line, if that happens. An extension into Mexico has also been floated, though I have no idea if we’re even allowed to say that sort of thing out loud any more. As this is a TxDOT project, one presumes that there won’t be any questions about whether or not this qualifies as a real railroad for eminent domain purposes, which is not to say that there won’t be any resistance to the possibility. I’m never sure how seriously to take this, as TxDOT has never been all that interested in anything but roads and there are plenty of ways for the chuckleheads in Congress and the Lege to put up obstacles, but we are at the DEIS stage, and that’s progress. What do you think? See here for the impact statement, and KVUE has more. I clicked through to your earlier post about the AG opinion sought by Rep. Cook that Texas Central Railway lacks eminent domain powers, and also read the opinion request. The Attorney General’s website section on opinions shows that request as “Closed-Lit,” which I assume means that it is in litigation and thus the AG will not offer an opinion. If anything, this article seriously underestimates the need along this route. Where it says that Oklahoma City to Laredo is about ten million, the actual number in the metros from Dallas/Fort Worth to San Antonio alone (half the route) is about 13 million (about as many people as Illinois or Pennsylvania, the 5th and 6th largest states of the US) and growing at an astounding 200,000 per year; not only do a majority of Texans live in the eastern half of the state, about 75% of them (21 million, more than Florida or New York, the 3rd and 4th largest) live in the 30% or less of the state located in the Texas Triangle, which is the I-35 line extended eastward to I-45, DFW to Houston), and growth of well over 300,000 per year. Our conceptions of what the state has become and continues to become lag well behind the reality. The DFW to San Antonio route already exists. If it’s like the LA/NOLA route, it’s only 3 times a week. Check the Amtrak site for where the current stations are.